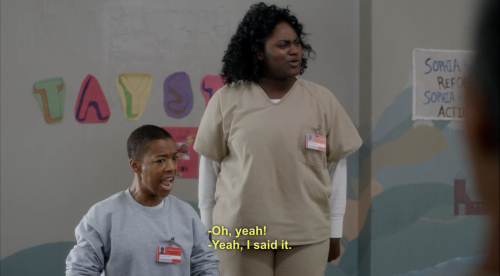 The net is abuzz with chatter about Netflix’s hit Orange Is the New Black. 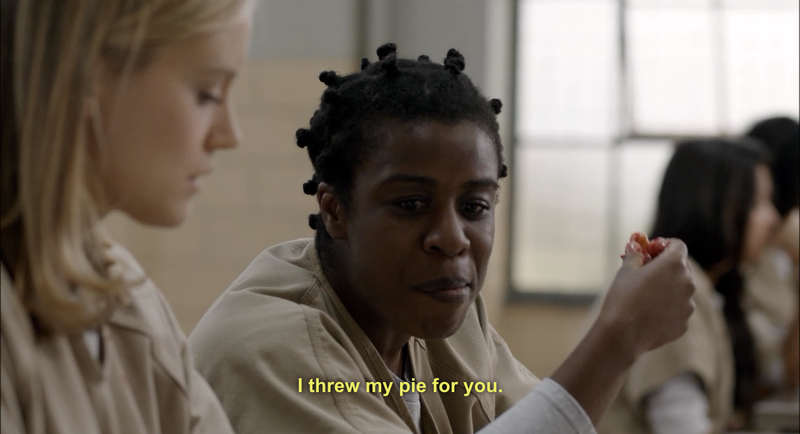 The 13-episode season, perfectly suited to binge consumption, is centered around a privileged, blond protagonist (Piper) sentenced to one and a half years at a minimum security prison for a crime 10 years past. While the first episode narrowly follows Piper’s fearful introduction to the prison’s “tribal” culture, the series quickly expands to an omniscient view so we can understand the cast’s diverse characters with flashbacks into their histories. Prison politics explore race, class, power and love and a major vehicle for that exploration is food. 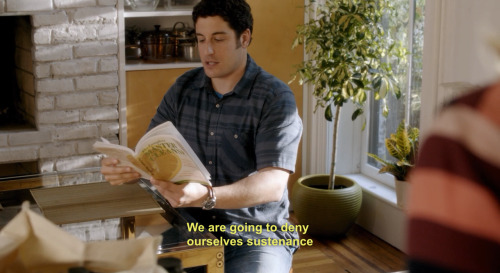 Food is debuted immediately following the title sequence of Orange with Piper and friends preparing a whole roast pig for a “last supper” before self surrender. The characters are conscious of both the metaphorical interpretation of the pig as a placeholder for cops and the excess of sharing a whole pig among four people. That’s when we know to pay attention to the food throughout the series. The four themes below run the vein of the show, but hilarious and thoughtful glimpses of food are everywhere. Spoiler advisory. 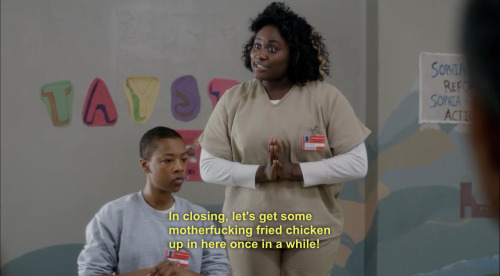 It’s no shock that race is a central theme of an American prison comedy, but the head-on acknowledgment of food stereotypes is refreshing. 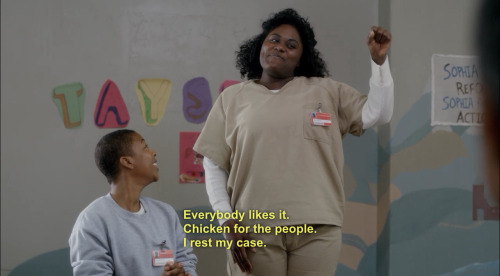 In her bid to represent the inmates to the counselors through an elected council, Taystee tackles the oft-repeated association of Black people with fried chicken head-on. She refuses to believe that this is a negative association and demands chicken for the people – a universal benefit. This shows great comfort in the way that her own identity is perceived by others while at the same time it deracializes and acculturates the food into American, if not global, foodways. 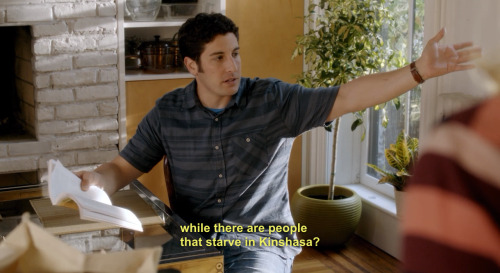 Food, or lack there of, was the focus of Orange‘s second episode. After commenting that the prison food was disgusting to Red, the woman later identified as the head of the kitchen, Piper is punished by starvation. With no money to buy foods from commissary, and an untouchable status put on her by the powerful Red, she spends her first days in the prison facing no access to food for the first time in her life. The food is just barely out of reach, always swept away by an agent of Red’s power within the institution. The writers immediately juxtapose starvation with a privileged, “white woman” food choice from her past: a juice cleanse. Piper convinces her fiancé to join her in cleaning the toxins from their (already drug free, locally grown, grass-fed, conflict free) diet. Not only must they internalize the choice for a week, but their diet would be on public display at social gatherings as a testament to their upper middle class occupation with their diets. Who else would buy the book and all the accessories for a week of lemon juice with cayenne? Certainly not a low-wage earner who budgets based on calories (a flawed method, indeed) because she needs the energy for her physical job and family. Red’s power was first revealed when she delivered yogurt cups to several members of her white tribe at Piper’s first dinner. The limited collection of well-connected insiders, again divided on tribal lines, were given access to the special resources of higher quality food. The yogurt being distinguished from the pudding served to all which, as described by Yoga Jones, “comes in big cans marked desert storm. Sometimes the kitchen has to scrape the mold off the top before they serve it.” In the fishbowl of the prison cafeteria, other races glare as this wealth is narrowly distributed to the middle/upper class whites. At the end of the season, Red’s loss of power is also expressed through food. 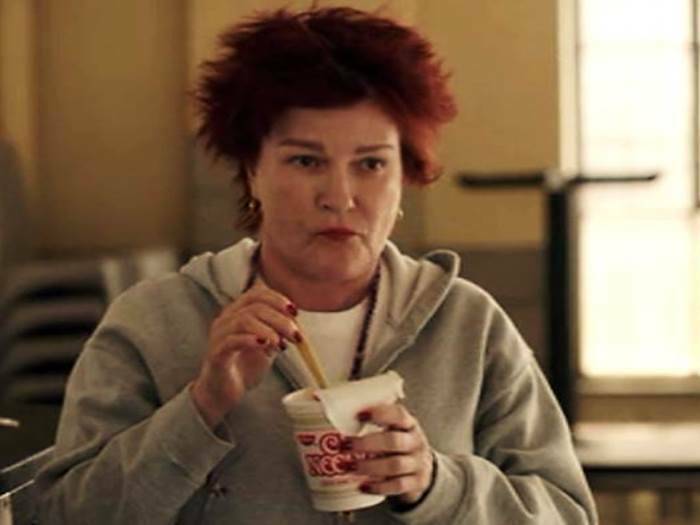 Removed from her station by the corrections officers after Mendes’s scandal and denied the cafeteria line because of her own scheming, Red is shown on multiple occasions in a solitary meal of Cup Noodles from the prison commissary. The would-be social experience of prison mealtime is reduced to low-nutrition, individually packaged, just-add-water, microwaved eating. The Cup Noodles represent a level of punishment beyond even prison food. It makes you think of the dismal moments in life when Cup Noodles was the plat principale in your own life. I almost don’t want to use the word love here because it’s truly a tangle of expectations, comfort, and insecurities. But maybe that is the definition of love. We see both Tricia and Piper in a moment of uncertainty about their future companionship. For Tricia the turning point is the release of her prison girlfriend, Mercy, whom she is afraid will abandon their relationship once out of the institution. As a final sign of affection and dedication, Tricia goes to great lengths to put on a farewell celebration and asks Miss Claudette to make her special cake from Easter. With refusal she presses on, even offering sexual favors, but she is to convince Miss Claudette to make the effort and walks away with a stayed sense of uncertainty. Piper’s challenge is quite opposite – she wants to find the one. As Piper examines her free-spirited, bisexual, and inconstant history she realizes how that flood of choices has left her lacking a true companion. And so it seems that she takes her best friend’s definition of ‘the one’ on as her own: someone who knows when to stay in and order Chinese food. It’s a sweet notion – that the right someone is ok with curling up together, apart from the world, to do something completely ordinary. But as the season progresses, and she and Larry find cracks in their relationship, you have to wonder if Piper has tried to put herself into a mold that was not right for her way of loving. So those are my favorite food themes, but the show is laced with quips about king cones, rotisserie chickens, eggs, and so on. What are your favorite moments from the show? Do you think food will survive into season 2?